Palestinian scholar; disciple of the patriarch Judah I. and school associate of his son Simeon ('Ab. Zarah 19a); one of the semi-tannaim of the last decades of the second century and of the early decades of the third. He assisted Judah in the compilation of the Mishnah and contributed baraitot (Yoma 24a). Many of Levi's baraitot were eventually embodied in a compilation known as "Ḳiddushin de-Be Lewi" (Ḳid. 76b; B. B. 52b). In the Babylonian Gemara Levi is seldom quoted with his patronymic, and neither in that nor in the Jerusalem Gemara nor in the Midrashim is he quoted with the title of "Rabbi." Keeping this in mind, the student of rabbinics will easily determine whether passages written under the name "Levi" without a patronymic must be credited to Levi bar Sisi or to a younger namesake who is almost always cited as "R. Levi" (see Levi II). 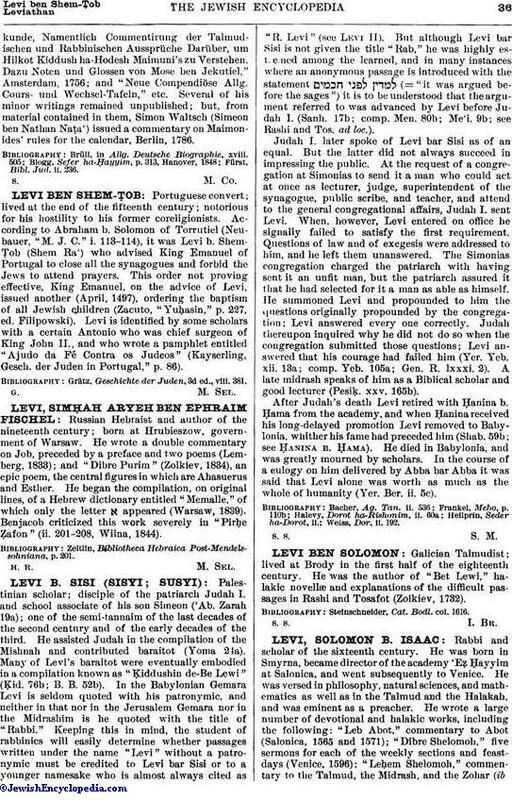 But although Levi bar Sisi is not given the title "Rab," he was highly esteemed among the learned, and in many instances where an anonymous passage is introduced with the statement (="it was argued before the sages") it is to be understood that the argument referred to was advanced by Levi before Judah I. (Sanh. 17b; comp. Men. 80b; Me'i. 9b; see Rashi and Tos. ad loc.). Judah I. later spoke of Levi bar Sisi as of an equal. But the latter did not always succeed in impressing the public. At the request of a congregation at Simonias to send it a man who could act at once as lecturer, judge, superintendent of the synagogue, public scribe, and teacher, and attend to the general congregational affairs, Judah I. sent Levi. When, however, Levi entered on office he signally failed to satisfy the first requirement. Questions of law and of exegesis were addressed to him, and he left them unanswered. The Simonias congregation charged the patriarch with having sent it an unfit man, but the patriarch assured it that he had selected for it a man as able as himself. He summoned Levi and propounded to him the questions originally propounded by the congregation; Levi answered every one correctly. Judah thereupon inquired why he did not do so when the congregation submitted those questions; Levi answered that his courage had failed him (Yer. Yeb. xii. 13a; comp. Yeb. 105a; Gen. R. lxxxi. 2). A late midrash speaks of him as a Biblical scholar and good lecturer (Pesiḳ. xxv. 165b). After Judah's death Levi retired with Ḥanina b. Ḥama from the academy, and when Ḥanina received his long-delayed promotion Levi removed to Babylonia, whither his fame had preceded him (Shab. 59b; see Ḥanina b. Ḥama). He died in Babylonia, and was greatly mourned by scholars. In the course of a eulogy on him delivered by Abba bar Abba it was said that Levi alone was worth as much as the whole of humanity (Yer. Ber. ii. 5c).